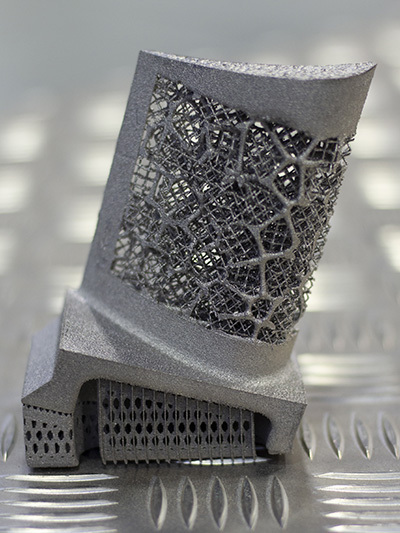 Working in collaboration with colleagues from Imperial College London, MAPP Director Professor Iain Todd, Department of Materials Science and Engineering at the University of Sheffield, has been taking a novel approach to the development of engineering components produced using additive manufacturing. Additive manufacturing (AM) is often used to produce engineering components. 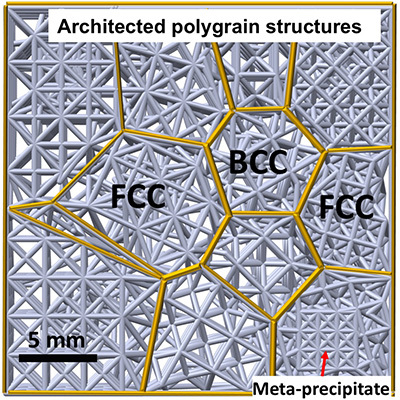 By utilising lattice structures (such as that shown below) to replace solid materials, these components are much lighter than their solid counterparts and can be engineered in such a way that they also exhibit property combinations that are inaccessible to conventional solids. These structures are known as architected materials. Regular lattice structure typically found in AM components. These lattice structures typically have a uniform layout with nodes all conforming to a regular array with the struts between the nodes all following common planes: and herein lies the problem. The work, detailed in Nature magazine on 17 January 2019, explains how these uniform lattices replicate the structure of a metallic single crystal: the nodes in the AM lattice are equivalent to the atoms in the single crystal and the struts are equivalent to the atomic bonds. In each of these structures, the atomic planes, or nodes are all perfectly aligned. While in some applications, such as the high temperature end of a jet engine, single crystal materials are ideal because of their ability to withstand deformation at extreme temperatures, they have limitations relating to their mechanical performance. This limitation is also observed in AM parts with a uniform lattice structure. When the structure is put into compression, once the force is sufficient to cause permanent deformation, the lattice shears along one or more of the planes of nodes. With nothing to inhibit this shearing, the collapse becomes catastrophic. In polycrystalline materials - those with many crystals - the alignment of the atomic planes is random, so when a shear force is in a particular direction, a crack will slow down or stop when it meets a crystal where the atoms are aligned differently from the crystal in which the crack initiated. Moreover, it is possible to introduce different materials in the form of phases, precipitates or inclusions used to strengthen the materials; these materials also help to inhibit crack propagation. It is this fundamental metallurgical understanding that inspired scientists at Imperial College London and the University of Sheffield to mimic polycrystalline microstructures in AM lattices with the aim of developing robust, damage-tolerant architected materials. Through the computer modelling of atomic structures, scaling them up and creating meso-structures based on polycrystalline materials, engineers are transforming the way that materials are designed, for which the name ‘meta-crystals’ has been coined. Demonstration artefact showing varying orientations of meso-structures. Experimental testing of components made from these meta-crystals has demonstrated that they are highly energy absorbant, with the polycrystal-like material able to withstand almost seven times the energy before failure than the materials that mimic the single-crystal structure. While the basic metallurgical concepts are being used to inspire the development of architected materials, researchers are using the creation of architected materials as an alternative approach to study complex metallurgical phenomena. 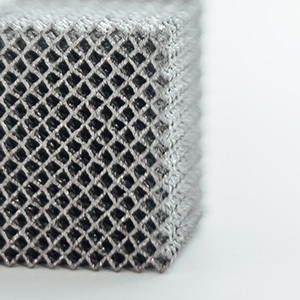 Prof Iain Todd said: “This approach to materials development has potentially far-reaching implications for the additive manufacturing sector. The fusion of physical metallurgy with architected meta-materials will allow engineers to create damage-tolerant architected materials with desired strength and toughness, while also improving the performance of architected materials in response to external loads. Dr Minh-Son Pham of Imperial College London: “This meta-crystal approach could be combined with recent advances in multi-material 3D printing to open up a new frontier of research in developing new advanced materials that are lightweight and mechanically robust, with the potential to advance future low carbon technologies." Further details of the research can be found in Nature, Vol 565, Issue 7739, 17 January 2019 (DOI: 10.1038/s41586-018-0850-3).